MOVING FORWARD WITH MUSEUM… From left, MOVE curator, Shaun Leonard, MOVE board member, Carrie Donaldson, MOVE operations manager, Jenna Buzza, outgoing curator, Graeme Balfour, MOVE board deputy chairman, Peter Hill, Greater Shepparton City Council Mayor, Cr Kim O’Keeffe, Federal Member for Murray, Damian Drum, local businessman, Jim Andreadis and MOVE board chairman, Ben Goodall. Photo: Will Adams. THREE hundred people from across the community had the chance to learn about the development of the iconic new attraction for Shepparton, the Museum Of Vehicle Evolution (MOVE), at a special launch event held last week. MOVE Shepparton is set to be an interactive and inspiring way to connect locals and visitors to Shepparton’s rich and important history of transport and the families, businesses and characters that have built the region. 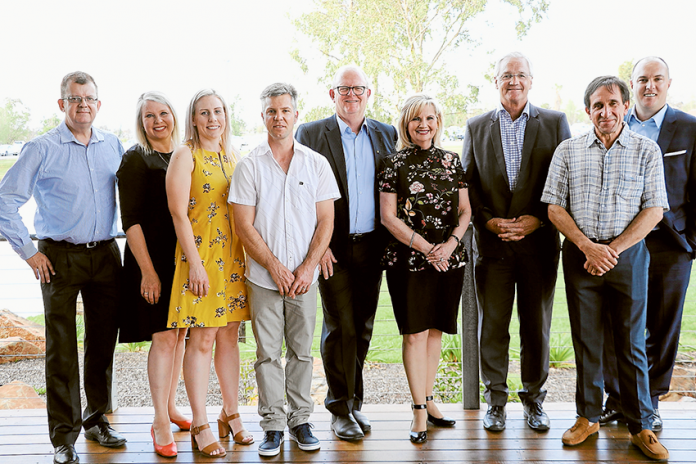 The MOVE committee is well on its way to reaching its funding goal of $5M, which has been secured from local and Federal Governments as well as generous donations from local families and businesses. Construction of the 9,000m2 building, which will be home to indoor and outdoor areas for displays and product launches, is set to commence next year at the existing Shepparton Motor Museum site with completion expected in the first half of 2020. MOVE board deputy chairman, Peter Hill said, “The launch event was a success. We had a good turnout for Shepparton and there was a real positive vibe. “We have secured conditional funding of $1.25M from council, on the proviso that the MOVE committee matches that funding and we have $2.5M from Federal Government and will now be making a claim for State Government funding. “The night was about saying ok, we’ve been to a number of local transport businesses in the region and we have raised close to $1M. “We started a ‘Legends Wall’ and we have many local people contributing to that and the launch night was also about helping to extend our reach with that.